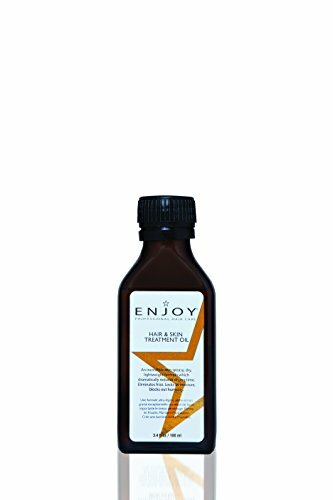 Enjoy Hair & Skin Treatment Oil (3.4 oz) - Luxury Beauty Care Products ! For hair that needs extra strength, now there is haircare that's gentle. The ENJOY Hair and Skin Treatment Oil system contains ingredients, which strengthens hair after just one use. This hydrating formula gently nourishes hair to leave it strong and silky. Aromatic properties help energize and invigorate the senses. Great for use with flat irons, blow dryers, and curling irons. Locks in moisture, blocks out humidity and frizz. Excellent for hair and skin. REPAIRING: repairing treatment, protein hair treatment, oil treatment for dry hair, oil treatment for colored hairLIGHTWEIGHT OILS: This incredible non-greasy, dry lightweight formula instantly penetrates and absorbs into hair and skin reducing drying time dramatically without buildup; smooth, condition, and seal with amazing shine; eliminates frizz and locks in moisture to block out humidity; alcohol-free; for all hair types; excellent for use on dry skin areas, cuticles, nails, feet, hands and elbows. This entry was posted in Hair Care on April 22, 2016 by admin.